The Horse Chestnut Extract Botanic Choice is reputed to have the proper qualities of treating Spider and Varicose veins. 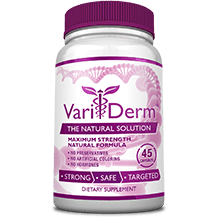 It has the ingredients, (so do the manufacturers say) that aid in the development of venous tissue. These kind of veins develop mainly because of pressure of stress on the body for a long duration of time. Pregnant women and people who are overweight are more prone to get them. Spider and Varicose Veins are treatable, but most people often ignore the conditions which with time, get worse and develop into more complicated health issues. Half of America’s population have them and most have had to go through surgery to rectify them. Meanwhile, they endure the painful ordeal of ulcers in the legs and other complications because that is what develops when you go for too long without treatment. Luckily enough, The Horse Chestnut Extract Botanic Choice is one of the many products out there that can offer this treatment for the Spider and Varicose conditions. 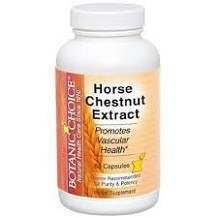 The following are ingredients that are found in the Horse Chestnut Extract Botanic choice. It is recommended that the patient takes two capsules everyday preferably with a meal. No side effects were listed for this product. They did however, warn against nursing or pregnant women taking the product without seeking the advice of their health professional first. It is also very important that you do the same; that is, as a consumer who is concerned about your health. It is quite astonishing to find that this product is only valued at 7 dollars per every bottle of 60 capsules. I’m sure a lot of people are not fans of highly priced products, but it does make one wonder whether the contents of this product are as good as they say they are. The contents of one bottle should last the individual a month. A solid guarantee for any product out there on the internet is always refreshing and assuring. This product does have a hundred percent money back policy. This guarantee would be all good and dandy if they gave a time frame of how long they are willing for the consumer to stay with the product before they can return it. It is not mentioned or made clear in the guarantee statement. The Horse Chestnut Extract Botanic Choice is a good product for Spider and Varicose Veins. The pricing of this product however, leaves the product on shaky ground. Furthermore, the guarantee also joins the uncertainty of the product. To add on to that, the ingredients are questionable, particularly the Maltodextrin ingredient. It is a food additive that is used for sweetening purposes. It is taken from starch and one should be weary of it because it does not give you any kind of health benefits at all. This product is not backed by the FDA.